The lymphatic system is not commonly talked about, but is a critical part of the body—you have twice as much lymph fluid as blood! It is a network of tissues and organs that rid the body of toxins, waste, and other unwanted materials; it is part of your natural sewage treatment system. Here, you will learn how to drain your lymphatic fluids safely. 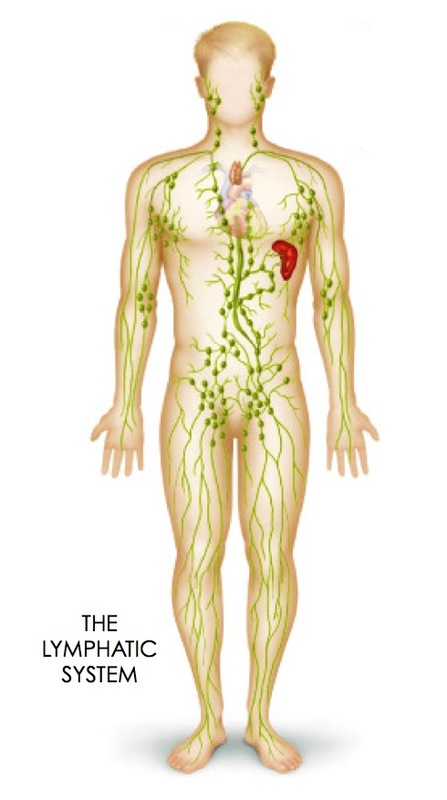 A primary function of the lymphatic system is to transport lymph fluid. Lymph fluid contains white blood cells that are instrumental in fighting infection all throughout the body. Thus, a healthy lymphatic system is key to a healthy body. Although there are many reasons why the lymphatic system and lymph nodes may become congested, these can be narrowed down to four major causes. Digestive imbalances may irritate intestinal villi, which is a classic reason for lymph congestion. As the majority of the lymph in the body surrounds the gut (Gut Associated Lymphatic Tissues – GALT), the quality of the villi are critical for proper lymph flow, detoxification, assimilation, and immunity. Iodine deficiency is also a common cause of lymphatic congestion. Iodine helps to mitigate the effects of a toxic environment and supports the lymphatic system at the cellular level. Constricting clothings that are tight-fitting such as brassieres with underwire, can impede normal lymphatic flow. One of the largest clusters of lymph nodes is located in the armpit and upper chest area, and those nodes act as a source of drainage for the breast, arm, and upper chest. When a bra is too tight, or if the underwire is too restrictive (for most of us this is the case), the lymph is constricted, preventing normal drainage. Some researchers believe that over a period of time this can cause long-term impairment of the lymphatic function, and may contribute to an array of conditions including fibrocystic breast tissue, swollen lymph nodes and breast cancer. Read more here. If you encounter at least three of the symptoms mentioned above, a lymphatic detox will benefit you. If you encounter more than five of the symptoms, then you definitely need a lymphatic detox. Three days is all you need to drain your lymphatic fluids. Take a long weekend when you can be at home completely for 3 days to do this cleanse. It is not difficult, but it can be tiring and some rest is required. Read through the following and prepare yourself to consciously do as many of the following as you can, especially the rebounding exercise. That exercise alone is a very good exercise to move your lymphatic valves for draining of the stagnant fluids. Drink any of the recommended herbal tea throughout the three days. Do some brisk walking, legs up on the wall exercise, take a detox bath, dry skin brush, and drink plenty of water and/or green juices. Feel the difference after a good lymphatic detox, and continue with it if you think you could do with more help to drain your lymphatic fluids. Lymph is about 95% water, making water essential for its health. One of the most common causes of lymph comgestion is dehydration. Without adequate water, lymphatic fluid cannot flow properly. Stay hydrated by drinking half your weight in ounces of water a day. Drinking the right fluid can adequately rehydrate the body. Water, freshly-extracted juices, herbal teas, broths are all excellent fluids that will help the lymphatic system moving. To have deeper cleansing, always add lemon to your water and juices to mineralize the body and the lymph. Drinking green vegetable juices is one of the best things you can do for your body as it does deep cleansing of all your detox organs, including your lymphatic system. A 3-day juice fast will give your body a very good cleansing of not only the lymphatic system, but also of the intestines, liver and kidneys. Red root (a.k.a. Ceanothus americanus or New Jersey tea) is the premiere lymphogogue, an herb that is helpful in reducing swollen lymph nodes and is used to treat lymphatic congestion, reduce cysts, relieve the stagnation of fluids and send nutrition to the tissues. Burdock root is an excellent lymph cleanser. Use ground burdock root and make tea of it. Drink 3 to 4 cups a day for a week to help remove congestions from the lymphatic system. Cleavers (a.k.a.Gallium aparine) is a great herbal tea for supporting the lymphatic system. It is a gentle lymphogogue that can reduce the swelling of lymph nodes and help dissolve cysts. As a diuretic, it helps the body pass wastes from the lymphatic system through urination, and is also used to dissolve kidney stones. Echinacea supports immunity by helping to cleanse the lymph fluid. It activates macrophages against invading microorganisms and tumor cells, and increases T-lymphocyte production—cells that are responsible for cleaning up the extra-cellular fluids during acute or chronic illness. Red clover helps to increase circulation, which helps to detoxify the body and reduce inflammation. Manjistha is an Ayurvedi herb that is primarily utilized for its ability to de-stagnate lymph. It does this by detoxifying the tissue and supporting lymph flow. Another excellent way to get the lymphatic system moving that anyone can do, is to exercise. The best type of exercise for detoxifying the lymphatic system is rebounding. Rebounding exercise is jumping on a small or large trampoline. 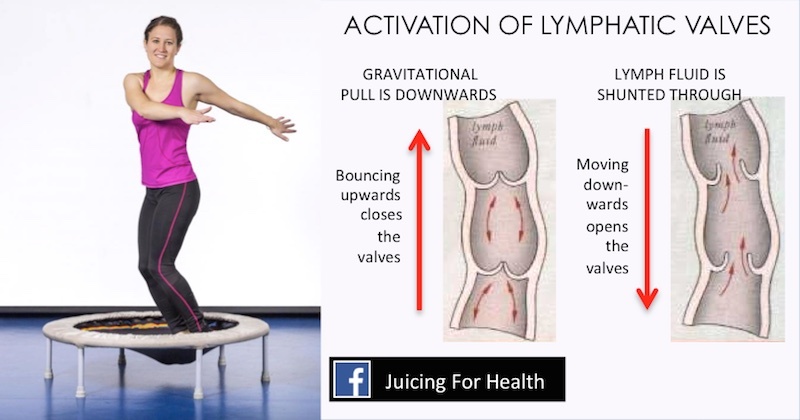 Jumping helps open up the lymphatic valves for better circulation. Do this for 15-20 minutes a day. Be sure to drink plenty of water after rebounding to help the flushing of toxins for elimination. Read more about the full health benefits of rebounding exercise. Near infrared sauna therapy penetrates deeper into the skin, and allows the body to sweat while in parasympathetic nervous system mode, so toxins are being sweated out. The circulation/release of toxins, the regeneration of tissues, and the heat all work together to improve lymphatic flow. It is important to get the body moving and the lungs functioning. Brisk walking is something everyone can do outside or at home. Make it a point to walk for about 45-60 minutes every day. Breathe as deeply as possible while walking. Walking has many benefits. That is right. Laying down with the legs straight up against the wall will improve the lymphatic flow in the legs. See diagram above. Putting your legs up encourages the activation of the lymphatic valves for eliminating toxins. This will also help you sleep better in the night. Physically help the lymph to drain with a massage. Check it out in the video below! Sitting down all day is not good for lymphatic fluid flow. 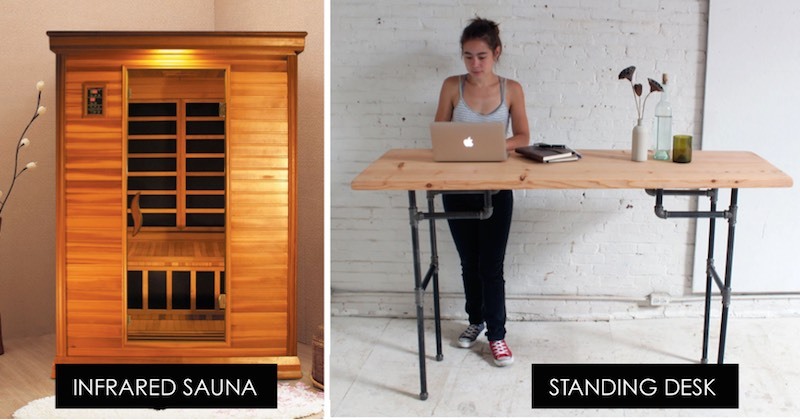 A standing desk makes it easier for the lymphatic to drain and allows for more natural movements during the day. Hydrotherapy shower is a shower where hot and cold water are used alternatively. Towards the end of your shower, just switch the water quickly from hot to cold a couple of times. Here is a link for more information on hydrotherapy showers. Just brushing the skin with a natural bristle brush improves lymphatic flow. Dry skin brushing is phenomenal for optimizing the detoxifying effects of what you’re doing above. It not only helps to increase lymph flow, but also improve organ functions and increase your energy levels. Purchase a natural (not synthetic) bristle brush with a long handle so you can reach all areas of your body. Get naked and stand in a bathtub or in the shower room (you will have a shower afterwards). Start brushing, beginning from your feet and moving in long sweeping motions, always toward your heart. Then move on to your hands, still brushing towards your heart. Brush several times in each area, there will be overlaps and that’s fine. Take care as you brush over more sensitive areas, like your breasts. Your skin may be sensitive initially but it will become less sensitive the more you dry brush. When you’re done dry brushing, take a shower. Alternate between the hottest water temperature and the coldest that you can tolerate. This stimulates blood circulation, bringing more blood to the top layers of the skin. Once you get out of the shower, pat dry you body, don’t rub hard. Apply a natural oil such as coconut oil on your skin for moisturizing. If you can, dry brush every day before you shower and see the amazing results just within two weeks! Remember to clean your brush with soap and water after every two or three times of dry brushing. Leave it to dry in a dry place to avoid mildew or mold forming. To have even better and faster effect, at least once or twice a week, take a detox salt bath. This is maximum self-care. Not only do you get the lymph moving more efficiently, you also lose all bodily aches and pains and see your health improve tremendously! Deep breathing promotes lymph flow. Your lungs pump your lymphatic fluid. Stretching the arms to both sides then move your ARMS up while breathing in (through the nose) and at the same time make circles with your HANDS (deep breath from the lungs, not the stomach, the expansion of the lungs squeezes the thoracic duct and creates more flow). Hold your breath shortly. Next, move your ARMS down while breathing out (through the mouth) and makes circles with your HANDS as you move the arms down. After doing this a few times you may feel a bit light-headed which is a sign your body is dispelling toxins. You will need to stop at that point. With time, you will be able to do this for longer. Think in your mind as you are doing this exercise: “wash the cells, feed the cells, purify the cells” to help pump out the toxins.